How to Create fake Facebook Chat and Edit Facebook Chat Conversations: According to a survey, people spend almost four to six hours of their time on social messaging apps everyday. Hence, socializing through Facebook has become a trend of our life. Earlier, Facebook was used to connect with our acquaintances who were far away from us, but today it has become an addiction. We spend most of the time chatting with our friends on Facebook. We update attractive statuses, have fun with the latest happenings and play pranks on our friends. Playing pranks on your friends is the funnest method to kill your boredom. Talking about the pranks… let’s come to the naughty side now 😛 . Have you ever thought of creating fake Facebook chat conversations which never existed or editing the existing chat with some naughty text?? I know your mind says YES to this question. And let me tell you that this is possible. You can make your friends fool by this trick and have fun with them. There are many ways via which you can create fake Facebook chat conversations. It’s up to you which one you use. I’m gonna explain all the tricks via which you can create fake Facebook chat or edit existing Facebook Conversations in this article. Open your Google Chrome or Mozilla Firefox browser. Now, open up the chat (in full screen window) you want to edit. See the below image of sample unedited chat. Now, a new window will pop up at the below on your screen. Find the message. It will be enclosed within HTML tag <p></p>. Right click on the message and choose “Edit as HTML” or you can double click it. Now, edit the message. Once edited, close this pop up window. Likewise, edit all the other desired messages. Once you have edited all the messages, take the snapshot. NOTE: Once edited, do not refresh the browser tab or else everything would be back to its original text. It is a temporary change. As I said playing pranks on friends is the funnest method to kill your boredom. Therefore, one day.. out of boredom, while browsing the internet, I found that some websites are providing the same service free of cost. It is also helpful for those who do not want to fall on HTML stuffs. So, I selected the two best websites that can help you create Fake Facebook Chat Conversations. 1. Simitator.com : It is the best website to create fake Facebook chat conversations. It has multiple options. One can also use it to generate tweets and Facebook statuses. 2. Fakeconvos.com : It is one of the best website to create fake Facebook chat conversations free of cost. But you need to log in with your Facebook account to use its services. You can also use it for multiple options like Simitator.com. In the huge market of android apps, there has to be a funny android app that can do the same. 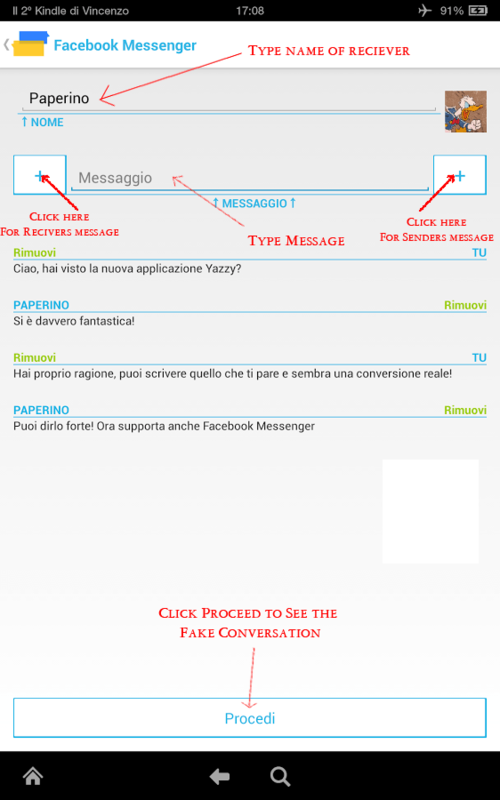 And I found that amazing app that can allow you to create fake Facebook Chat conversations. The best part of the app is that the fake conversation looks just real. The name of the app is Yazzy. 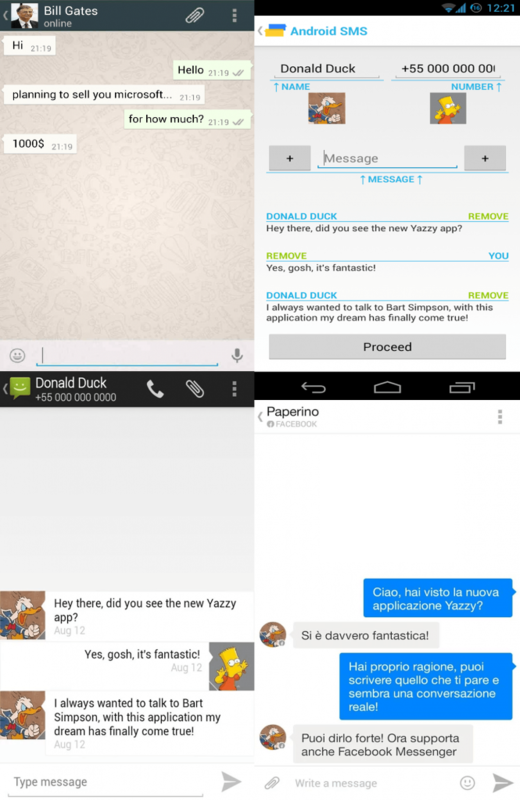 Yazzy is an android application which lets you create pranks, jokes on your friends. It allows you to create fake chat conversations on various platforms like Facebook, Whatsapp, Facebook Messenger, android SMS, iPhone SMS. It has a potential future growth with upcoming additional services. At first, download Yazzy android app from the below link. Once you download the app, open it. 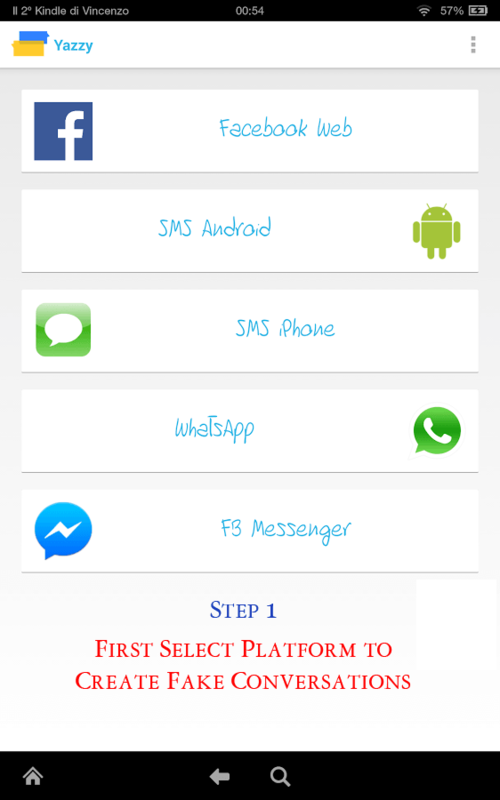 Now select the platform for which you want to create fake conversation. After selecting the platform, fill out the suitable details like receivers name, receivers message, senders message, etc. Finally, click the “Proceed” button to generate the fake Conversation chat image. Previous articleAndroid: HTC One Mini 2 full phone specifications.